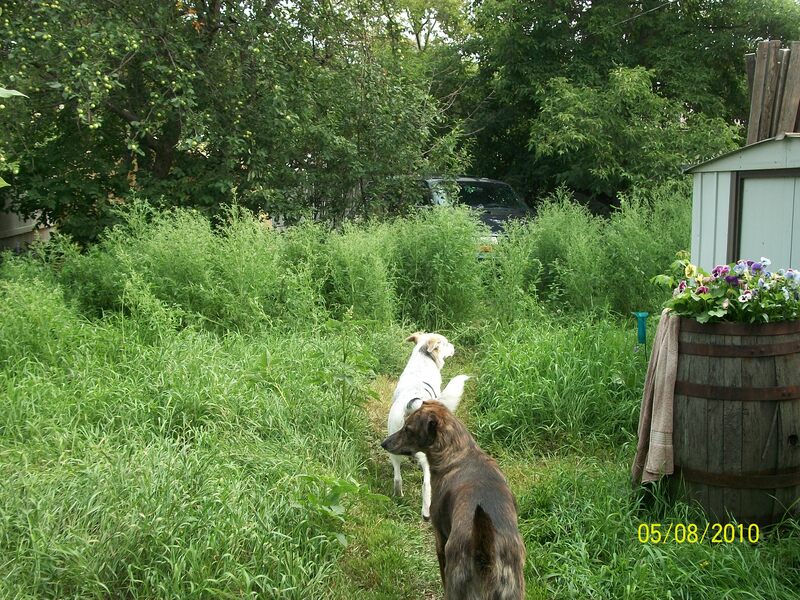 You remember those weeds I was so diligently vinegaring a couple of months back? Y’know, the ones I mowed? Well now the little beggars are as tall as I am, which puts them just over 5 feet tall. A few can almost peek over the 6-foot fence. Clearly vinegar isn’t the nemesis I’d hoped it would be. I tried mowing some yesterday, but that was a pointless exercise. Today I had a “THAT’S IT!! !” moment and laced them with RoundUp. I will NOT be bested by a yard full of mindless weeds! Sparrow and Sounder wonder if anything’s lurking in there. Yes, I’ve also noticed that while vinegar kills the plant, it doesn’t get to the root. Darn. Apparently when I was pulling them out and THOUGHT I was getting the roots, I wasn’t. Mine are all back too, they took happy advantage of my time out of town. I’ve found that when it kills something (like thistle) it does a wonderfully thorough job. However, there are ones that it doesn’t even touch, like these guys, that just keep growing and growing and growing…..